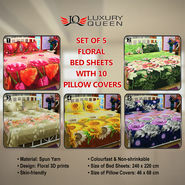 Indulge in everyday luxury with these floral 3D bedsheets with pillow covers. Extremely soft, smooth and easy to care for, this quality bedding made from spun yarn fabric ensures comfort & is great for gifting too. If you have plain or solid colour or no decor on the walls of your home, consider buying Set of 5 Floral Bed Sheets with 10 Pillow Covers. It will definitely add an element to your living spaces instantly. Material: Made of spun yarn fabric, these 3D printed bedsheets feel soft and gentle against skin. Moreover it gives them a great deal of breathability and comfortable feature ensuring a comfortable sleep. Durability: The fabric is colourfast and it washes well without fading, while the designs and prints gives new and fresh looks always. They are also, anti-wrinkle and shrink resistant. 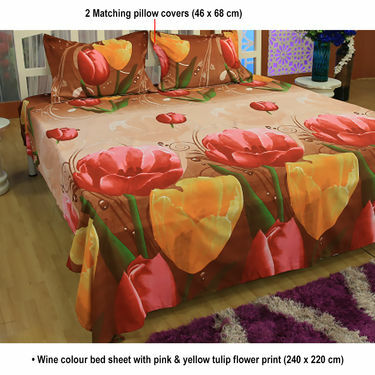 Size: The double (220 x 240 cm) bed sheets fit your beds seamlessly. Freebies: The combo comes with complimenting pillow covers that enhances the overall look of beds and bedroom without costing a fortune. 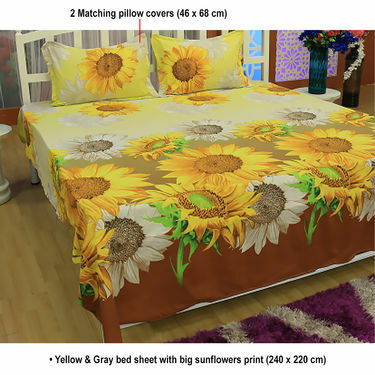 Reviewer: Styled with an enthralling colors, designs and patterns, Set of 5 Nature?s Love 3D Print Bed Sheets will flaunt your rich taste in exclusive bed linen. We definitely recommend this combo. 220Ã?240 is little small for our mattresses. Is there a little more big size in these bedsheets? 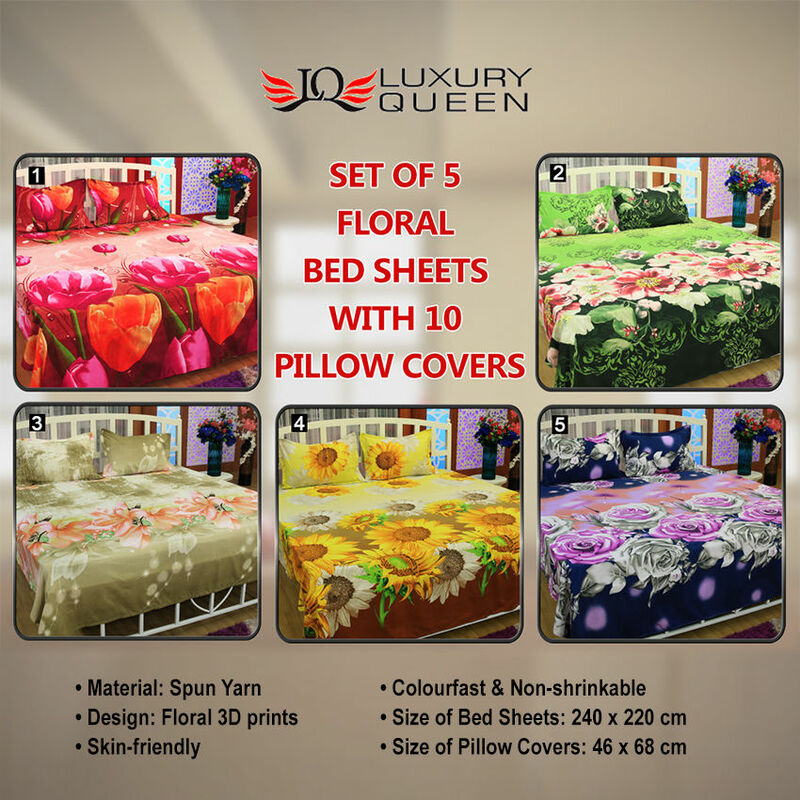 Set of 5 Floral 3D Bed Sheets wit..VSPhoolon Ki Duniya - 5 Double Beds.. Set of 5 Floral 3D Bed Sheets wit.. VS Phoolon Ki Duniya - 5 Double Beds..
Set of 5 Floral 3D Bed Sheets wit..VSSet of 5 Colorful Floral 3D Bedsh.. Set of 5 Floral 3D Bed Sheets wit.. VS Set of 5 Colorful Floral 3D Bedsh..
Set of 5 Floral 3D Bed Sheets wit..VSSet of 5 Nature's Love 3D Print B.. Set of 5 Floral 3D Bed Sheets wit.. VS Set of 5 Nature's Love 3D Print B..
Set of 5 Floral 3D Bed Sheets wit..VSSet of 5 Nature's Glory 3D Print .. Set of 5 Floral 3D Bed Sheets wit.. VS Set of 5 Nature's Glory 3D Print ..
Set of 5 Floral 3D Bed Sheets wit..VSPack of 4 Jaipuri Bedsheets (4DDB.. Set of 5 Floral 3D Bed Sheets wit.. VS Pack of 4 Jaipuri Bedsheets (4DDB..